The hemolymph of healthy marine invertebrates is known to harbor antibiotic-producing bacteria belonging to the genus Pseudoalteromonas. Such strains are potential probiotics to control infectious diseases in aquaculture. In the present study, we screened a collection of Pseudoalteromonas strains isolated from the hemolymph of oyster and mussel for antimicrobial activity against Vibrio harveyi, a pathogenic species responsible for high mortality in abalone. 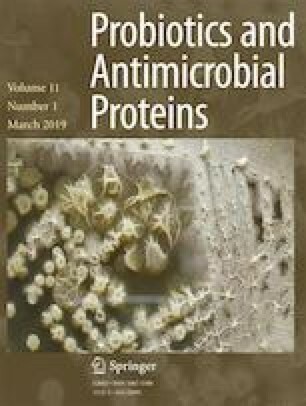 Subsequently, the protective efficacy of the most active strain named hCg-6 was investigated in abalone culture faced with a Vibrio harveyi ORM4 infection. First, we have controlled the Pseudoalteromonas hCg-6 safety for abalone health. To that end, animals were immersed for 4 h in Pseudoalteromonas hCg-6 suspensions in seawater. The abalone viability was monitored and Pseudoalteromonas hCg-6 was tracked by quantitative-PCR in abalone hemolymph. After immersion, no abalone death occurred while the strain hCg-6 was significantly detected in hemolymph. Therefore, the strain hCg-6 was considered safe for abalone and evaluated for its ability to protect abalone against V. harveyi (injection of 1 × 103Vibrio per animal). A 4-h long immersion of abalone in a seawater suspension of Pseudoalteromonas hCg-6 (1 × 106 CFU mL−1) prior to infection with Vibrio harveyi significantly improved the abalone viability. Indeed, 15 days post infection, the hCg-6 treatment used increased the abalone survival rate from 16% in untreated animals to 40% in treated abalone. We hypothesized that Pseudoalteromonas hCg-6 antibacterial activity increased the hemomicrobiota shielding effect. In conclusion, Pseudoalteromonas hCg-6 is a promising anti-Vibrio strain for abalone culture. Thanks are given to Dr. C. Paillard (CNRS) for the generous gift of Vibrio harveyi ORM4, to Morgane Nédélec and Rémi Bertran for their expert assistance in abalone rearing, to Denis Rousseau for expert advices in qPCR, and to Hervé Bourdon for manuscript corrections. This work was funded by the region Bretagne, France [ExMIM project, ARED 8347 and Haliobiote II project (IMA 2014, no. 14/D1215)]. Clément Offret was supported by a “Quimper-communauté” grant for PhD thesis.